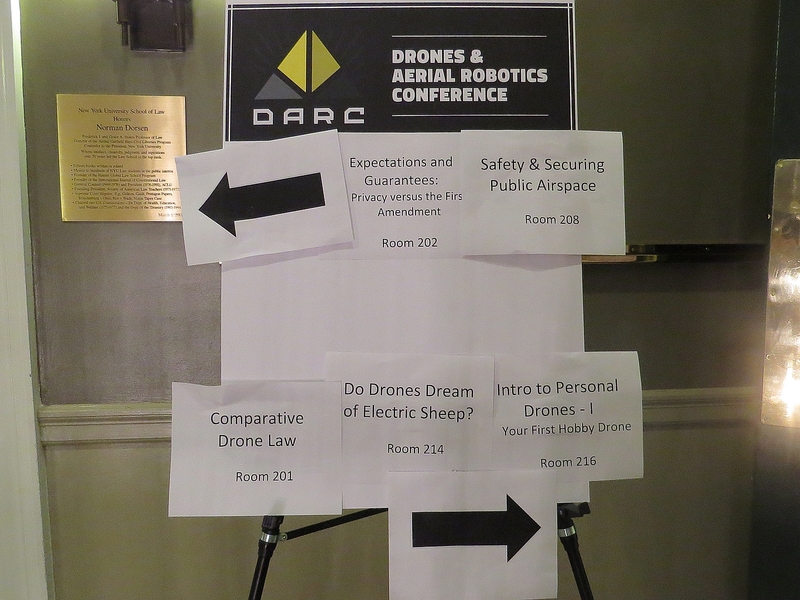 The second day of the Drones & Aerial Robotics Conference (DARC) started with a keynote by Colin Guinn of DJI, and ended with one by MIT professor and former Navy fighter pilot Missy Cummings. In between, there were speakers in the main auditorium and four blocks of break-out sessions upstairs, each with five or six tracks. I’m not an experienced drone or RC builder or flier, so I decided to attend all three “Intro to Personal Drones” workshops, and the “Drone User Groups” panel discussion. The three workshops had been generally planned to build upon each other, but were organized by different groups. So each had its own unique flavor. These were very popular sessions; attendance for all three workshops was standing room only. Russell de la Torre answering questions at DARC. The first workshop was presented by Russell de la Torre, founder of Scout UAV, a web resource for anyone interested in building DIY quadcopters. The website includes information on parts, materials and projects you can do. Russell’s talk was a reflection of this. He provided an introduction to products, websites, software, parts and materials that you will need, as well as the design choices you will need to make to build a quadcopter. Some of the UAVs Team Grey Goose brought for show & tell. 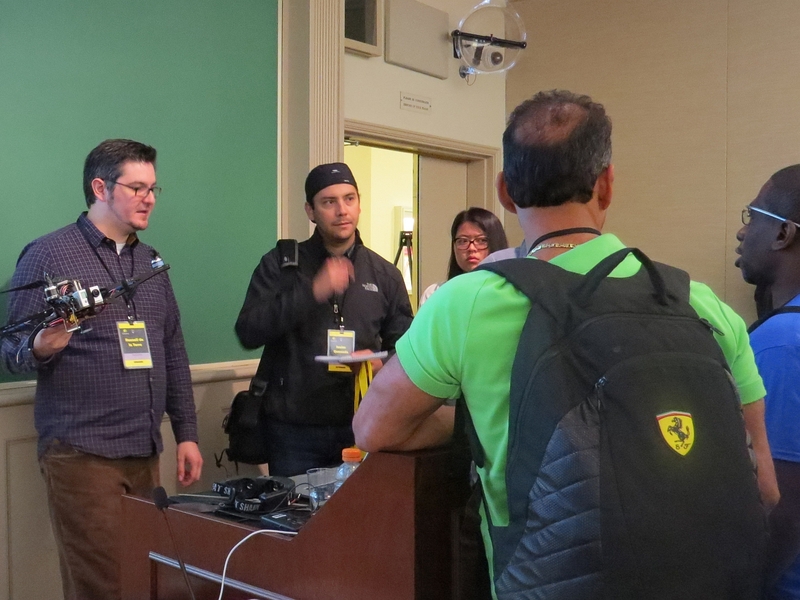 The second session was presented by Team Grey Goose, a community of First Person Video (FPV) fliers from the New York, New Jersey, and Pennsylvania region. The group meets regularly for flying sessions and to share information. They have also worked to develop community outreach activities like workshops and educational sessions. This session was very interactive, with each member offering advice and showing their multicopters (and one fixed wing UAV), and the audience asking many questions. 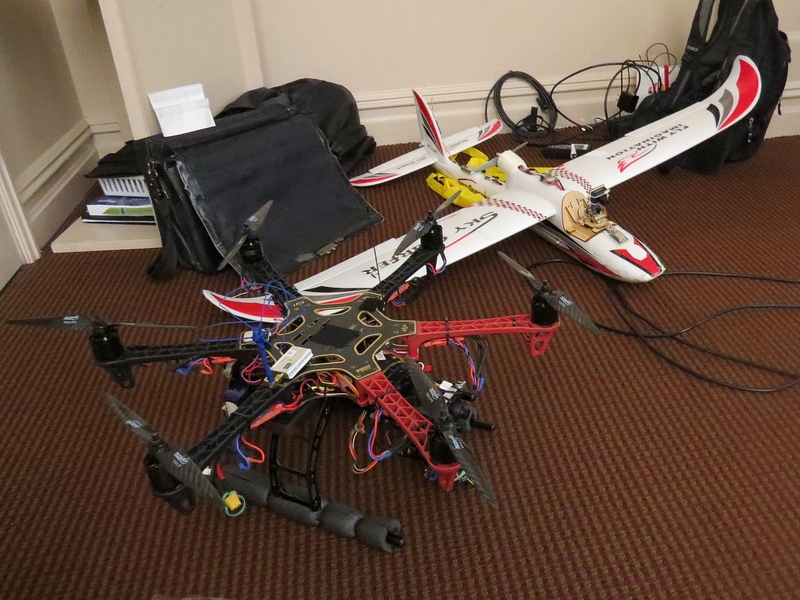 They covered types of platform (tricopter, quadcopter, coaxial props, fixed wing, etc. ), radio frequencies, antennas, ground stations, camera gimbals and more. 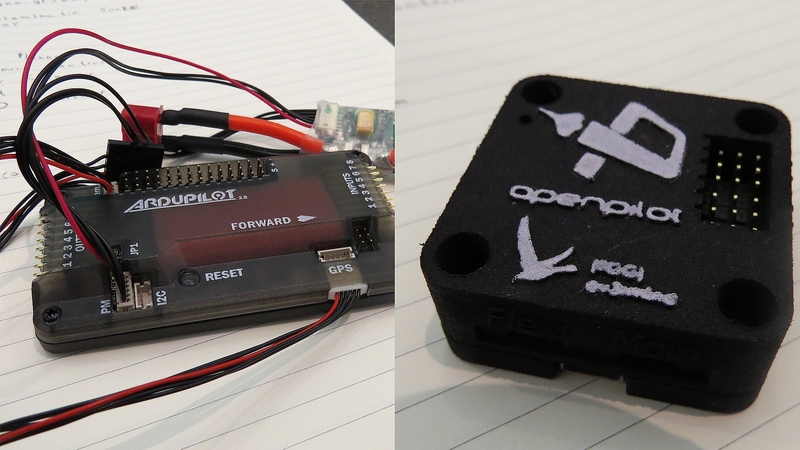 ArduPilot and OpenPilot, two UAV controller choices. The third workshop was presented by Gabriella Levine, COO of Protei, an open source sailing drone. Gabriella describes herself as a creative technologist, and has worked on many interesting robotic projects. Gabriella provided an overview of some basic robotics concepts, which was familiar ground for me but very useful for many audience members based on the number of questions asked. Then she reviewed some of the options you will have for electronics, software, and sources for parts and materials. She passed around example hardware, including the popular ArduPilot and OpenPilot controllers. Left to Right: Andra Keay, Chance Roth, Tim Reuter, and Bryan Galusha. The final break-out session I attended was the Drone User Groups panel discussion. This was more sparsely attended than the workshops, but the audience was very engaged and interactive with the panel members. 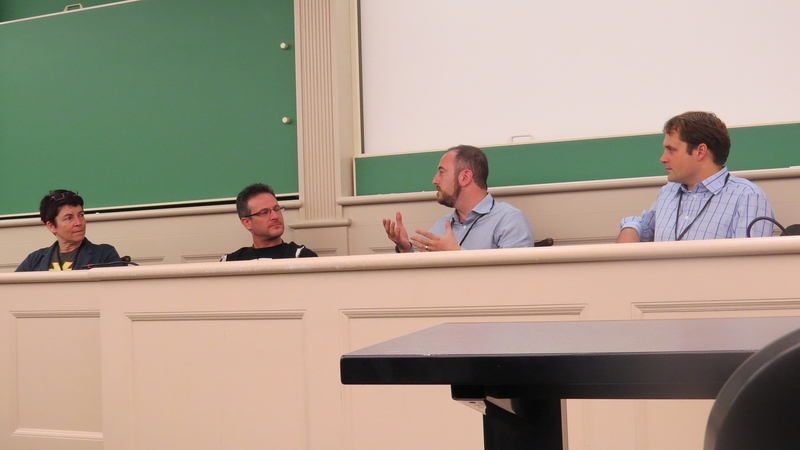 Timothy Reuter of the DC Drone User Group (DCDUG) chaired the panel. He was joined by Andra Keay of Robot Launchpad and two other members of the Drone User Group Network (DUGN), Bryan Galusha of the San Francisco Drones Startup Meetup and Chance Roth of the San Diego Drone User Group. The group led an active discussion about how to build a community around aerial drones, and some of the challenges they’ve faced and techniques they’ve used. One of the key topics was driving diversity and gaining a wider user demographic for their groups. Andra stated that you do this by building purpose into what you do. There is a niche of users who are turned on by the technology itself. If you want to attract a wider audience, you have to focus on the application of the technology and what it can do for people. The DUGN is embracing this through the introduction of their Drone Social Impact Award. According to their website, this is a cash prize for “the most socially beneficial, documented use of a drone platform costing less than $3,000”. The DUGN currently has eight member locations in the U.S. one in Australia and one in Mexico City. Contact them if you are interested in joining their network.